DJ Juan was OUTSTANDING! From our first meeting with him, he demonstrated true professionalism and pride in his craft. He was prepared, organized, and answered any and all of our questions. And his rates are very reasonable, comparative to other vendors, and knowing what I know now, he was worth every penny. On the day of our wedding, he arrived on time (which for him, meant early) and got everything set up and verified his equipment worked properly...the ceremony and reception went off without a glitch. He made sure to clarify any questions with us and was great about staying flexible with our timeline and guests. Once the dancing started, he kept the party going! We gave him a little direction as to what types of music we wanted (and didn’t want) and he ran with it. Great mixture of genres, slow/fast songs, and even made sure to throw in some songs for the kids to dance to. I honestly think that no one sat down the entire reception...they wanted to dance! Everyone keeps telling us how awesome our DJ was and we couldn’t agree more. 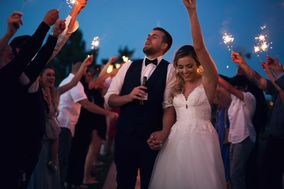 Thank you, Juan and Anna, for helping make our wedding day unforgettable and an absolute blast! Juan is amazing, his customer service is outstanding, he is friendly and everyone LOVED his service. Best DJ services ever! They were instrumental in helping to create a perfect wedding and reception for my son and my daughter in love. They are top notch and I would highly recommend their services to anyone. Juan Bautista was great, he worked great with my photographers to make sure everything went off with out a hitch. Had a blast with him and his girlfriend! Thank you! Juan was INCREDIBLE and worth every penny! He made the entire experience so much fun. I highly recommend him for any event. Super accommodating to our unorthodox wedding. He like's to know what going to happen and when to help facilitate the best experience possible, That did not happen due to our immense phot session. He rolled with the punches smile on his face and gave us everything and more! Friendly and polite to all our guests and very professional all around. Even when one of my groomsmen tried to take out his DJ booth, Sorry about that lol. He laughed it off and got the music going like nothing happened! Thank you so much for making our special day special! Extremely professional, our wedding wouldn't have been the same without them! Juan was amazing. Without him, I think the wedding could've had a completely different vibe. He made sure everything happened as planned but was flexible when we were ready for things earlier. His music selections were perfect, he read the crowd very well and we had people dancing until the very last song. I highly recommend working with him, his rates are reasonable and worth every penny! Dennis was awesome!! He was fun and did a great job as our DJ!! Would highly recommend!! Super reliable, professional, and very reasonably priced. I highly recommend DJ AV Moble DJs for any weddings or parties! Amazing work! 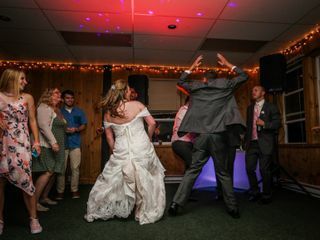 Did such a great job getting everyone on the dance floor and keeping our wedding upbeat. I would recommend him to everyone I know! Great job! Would recommend to anyone. Juan was so awesome throughout this whole pre-wedding process up to the day of our wedding. He was very quickly to respond to my numerous emails of questions, he was very helpful and experienced, gave great advice for our wedding day timeline. Juan was easy to work with, quick to communicate, flexible and was on point with the music for the ceremony and the dancing. I would highly recommend him. DJ Av Mobile is awesome! He arrived in a timely manner and was set up and ready to go by time event started. The music was perfect and the photo booth was a hit and a blast for everyone! Juan and his girlfriend were amazing! They took care of my husband and I as well as our guests, all night long and they definitely kept the party going!!! Juan and his girlfriend were absolutely amazing! Kept the party going, all night long! Juan got the students out on the dance floor, having an amazing time! We will definitely ask him back to DJ our future Dances! Juan was absolutely amazing! He helped make our big day special and stress free by making sure everything was flowing smoothly! He had everyone on the dance floor having a good time! I have used DJ AV mobile DJ's for several personal events and fundraisers. He is very reliable, reasonably priced, and keeps the party going. I would recommend their services to anyone that is interested in not having to worry about entertainment once they have arrived. I would just do it! Juan was the utmost professional. 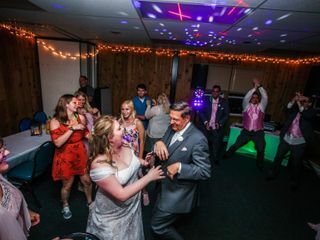 He kept our wedding moving and people danced until the very last moment! It was better than we could have even hoped for! Juan - thank you so much for making our day so fun!! Booking a DJ gives you peace of mind knowing that the reception is going to flow and run smoothly! Juan did a great job! He truly knows his stuff and was so helpful throughout the whole process while I was planning our wedding. Then on the day of I didn't have to worry about anything because he just kept the day flowing perfectly.